Q: I have been told it's not worth repairing my xylophones, marimbas, metallophones, or glockenspiels, as it is more cost effective to buy new ones. A: Don't you just love sales people! Always looking after your best interests! With regard to most good and even reasonable quality xylophones, metallophones, glockenspiels etc. it is easily possible to carry out repairs for a fraction of the price of a new instrument. Many of these repairs are easily within the scope of the average handi-person. With regard to hand drums however, our sales person may be correct. The cheaper hand drums with heads (skins) that are permanently attached are generally to expensive to repair. I always recommend the purchase of hand drums with retunable and removable heads. The ones with the clamps around the side. They are very easy to fix yourself. Hand drums with heads fixed in place with thumbtacks are not suitable for the classroom. Q: Do I need to bring instruments to you? A: No, most of my repair work can be carried out on site. Those items that require more attention in my workshop I can pickup and deliver. I do however charge for visiting, so if you want to stretch that budget, by all means drop items off to me. Q: Can I get an idea of the cost of repairs before hand? A: I am generally able to give an idea of the cost of repairs over the phone or by e-mail, but would need to look at instruments to give an exact figure. Emailing a photo often saves a thousand words. Q. Can I carry out repairs myself? A. Many of these repairs are easily carried yourself, and I'm happy to assist anyone who wants to give it a go. I am able to supply materials needed to make many of these repairs for those who want to stretch their budget further, and who have some tools and skills, or access to someone who does. Check out the instrument repair page for assistance with this. Or send me an email if something is not covered in this page. Q. What do I need to know when buying instruments? A. Here I have put up an article I wrote on this matter some years ago in a music teachers newsletter. The following information is designed to assist music teachers by giving some hopefully not to technical details of what constitutes a reasonable xylophone or metallophone. There are a few articles on the internet that describe in detail the mechanics and physics of these instruments in greater detail. The following will hopefully serve as a distillation of these more technical details for the average music teacher. Please let me know if this is useful, or still to difficult and technical to deal with. The classroom xylophones and metallophones usually associated with the Orff approach of music teaching are generally wood or metal bars on wooden (or something made to look like wood) resonating boxes. Below is a brief introduction. For a more indepth discussion look at the instrument repair page in the repairs page of this site. Here I will look at these parts separately. The critical aspect here is tuning. Wooden bars made in Europe or Japan or China will change pitch after adjusting to the Australian climate. Wood will be wood, and the drying out process that continues for many years for timber will most likely have caused your xylophone bars to go sharp. So, quite sensibly, teachers often buy instruments of the same brand, in the hope that the pitch of similarly manufactured instruments will match, and adjust at the same rate, which it often does. Metallophones however will not change, so in time they could sound flat in comparison to xylophone bars. There are alternatives however. Tuning can be adjusted back to concert pitch relatively easily, and thus they can be in tune with everything! (well, everything else in concert pitch that is). I personally would buy a xylophone based on the construction of the box, and the tuning of the bars in terms of tuning of "harmonics", or "overtones"(read on! ), rather than to complement existing instruments. You might end up with a better quality instrument for less outlay, which can be spent on re tuning (which is not hard to do yourself). So when going shopping, arm yourself with an electronic tuner, but check the tuning of your instruments first, to see if they are sharp or flat, and by what amount. You can then check instruments in the shop against this reference. You could even turn this into a classroom activity. Now a bit of the technical stuff! Players of string instruments will be familiar with "harmonics". Harmonics are the partial vibrations of anything that vibrates at a rate that causes a sound. The main note of a string or bar or column of air is called the fundamental note. It is the main note you hear. The harmonics are the other vibrations occurring that are always much higher in pitch, less audible, and give that note on that particular instrument its "timbre". If you have a guitar handy, try placing your finger lightly (just touching the string) on any string immediately above the 12th fret. Don't press it down on the fret. Now pluck the string, and you should hear a nice "bell" like note one octave above the open string note. This is a harmonic, and all instruments have them, otherwise all instruments would sound alike. Xylophone and metallophone bars have them too, and a well tuned bar should have these harmonics tuned to the fundamental note of the bar during manufacture. In these bars the 1st harmonic is usually 2 octaves above the fundamental note. Unfortunately, this is not always the case. In my opinion this tuning of harmonics should be one of your primary concerns, if not the most important consideration in buying an instrument of this type. I have often been presented with a bass xylophone that a teacher feels is sort of out of tune, or doesn't sound right, only to find that the problem is untuned harmonics. Most of the time this cannot be fixed. I know of one popular and very expensive brand that no longer produces bars like this in some of their instruments, although their older instruments were superb, as well as some cheaper brands of the past that sound really bad due to un-tuned harmonics. It could be said that this issue of correctly tuned harmonics only applies to instruments up to about an A above middle C, as above this note, the higher harmonics are to high to be intrusive. Conversely the issue of tuned harmonics becomes more important in bass instruments, as the harmonics are very obvious. For example, a C below middle C, the 1st note of a classroom bass xylophone, will have a harmonic of C, 1 octave above middle C, which is very audible. This means all bass instruments and about the 1st half of an alto should be tuned thus. Above these pitches the harmonics become harder to hear (another classroom activity? ), and are also very short in duration. Now, how to find these harmonics, another classroom activity? Take a bass bar, or a low alto bar, hold it between thumb and forefinger on the top and bottom face exactly in the middle of the bar. This means that your thumb or finger will be sitting in the middle of the curved cut out section on the underneath of the bar, and the other finger or thumb will be in the middle of the top face of the bar. Hit it with a beater that is a little harder than you might normally use on that instrument. You should hear a note two octaves above the fundamental note of that bar. You may need to strike the bar in several different spots to get the best note. If you don't hear any note then you are doing it incorrectly. If the harmonic is something other than twice the fundamental then this bar was not made very well. You would rarely, if ever, find a Suzuki or Studio 49 (or my own Musaics) bar doing this. This phenomenon is more easily observed and can be more confusing on a metallophone, as the metal has more sustain and can sound many more even higher harmonics. As such this should be examined more critically on these instruments as a metallophone bar with incorrectly tuned 1st harmonic can sound really dreadful. The Xylophone and Metallophone Box. The box of course holds the bars up, but also should act as a resonator for the bars. In order to add volume to the bars, the volume of air underneath it should be of a certain amount. This is why one sees the inside of these boxes sectioned off. This cavity acts as a resonator, to aid in sound volume and projection. The technical term for this type of sound re-enforcement resonating device is a "Helmholtz Resonator". These sections work very much like a bottle that gives a sound when you blow across it. The pitch of course will vary as you make the space in the bottle smaller by adding water. The best instruments are the ones with a separate resonator for each note, like the concert marimbas or xylophones or vibraphones with the tuned pipes underneath them, but smaller instruments like this would be even more expensive, much bigger, and less robust, so the sectioned box is a good alternative. You could try placing bars from one brand of xylophone or metallophone onto another's box, just to see if there is any difference in volume. It surprises me that, given the volume of air that works best for a given note is pretty much governed by the laws of physics, and not brand or type of wood, that these resonator cavities vary so much in size between brands. I have found that the Studio 49 box design suggests to me that these manufacturers have done their homework the best. Be aware that some new instruments don't have sectioned resonating boxes at all. This may be OK for a soprano xylophone, but personally I would not buy a bass or alto xylophone or metallophone that has been built this way. This sort of construction usually produces an instrument that varies hugely in the volume of sound produced by different bars. With bass and alto xylophones, pay particular attention to the volume of the 1st bar on the instrument. That 1st C note gets used a lot for bass lines etc and should have a good strong sound. Again, try if you have the opportunity, placing for example a low alto C bar on various different brand instruments to see the difference in volume of sound from this 1st resonating cavity (another classroom activity?). In looking at new instruments then, it is a good idea to play a scale, and check that the notes don't vary too much in volume, bearing in mind that with this sort of instrument there will always be some variation. Worth looking for also is of course the strength. Boxes built from chipboard are not as strong as those built from thick 5-ply, but are heavier. Boxes are built from all sorts of material these days, which doesn't really affect the sound, but can affect it's survival in the classroom. Hope you spend those dollars wisely! What do I replace the rubber tubing on my classroom xylophone with? For anyone wanting to replace the rubber tubing that sits underneath and supports the bars on classroom style xylophones and metallophones, my suggestion is the silicone tubing that is available in aquarium shops, called "air hose". This material is soft enough, last a long time and is now available in handy 5 or 10 metre packets. Bassically any tubing that is a rubber type material, soft, with fairly this wall so that it is not to springy will work. You can use foam rubber strip or something similar as well. The harder plastic tubing is not good because bars tend to buzz against harder surfaces. Thicker wall tubing tends to cause the bars to boince of the instrument, instead of just absorbing the impact of stricking the bars. I get this a lot, especially in regards to guitars, violins, mandolins etc. Can I just say at the outset that anyone who judges an instrument by where it is made is a fool! Ok, if your not too offended then thank you. China, and some other countries, makes most of the worlds guitars, violins, amplifiers etc these days. Sure, they make a lot of things that should not be made, but that's because people want it at that price. To discuss for example violins, there are many many really good instruments made in China now. They may not quite compare to a good 100 year old German trade instrument, yet, but they are the good trade instruments of the future. Conversely, just because an instrument states that it is "handmade in Germany" does not make it a good instrument. In fact I have seen violins brought back by people with more money than, errr, well, sense, from Germany, that cost a lot, with a label stating it is handmade in Germany, when I know it certainly is not, as it is exactly the same as my Sons Chinese violin. 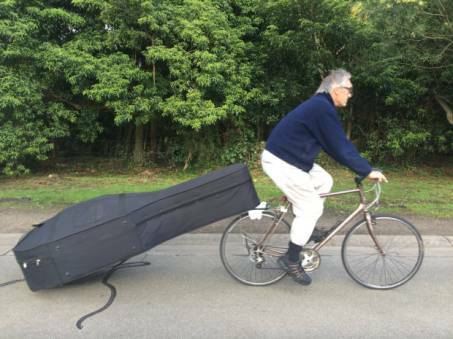 How big a car do I need if I play double bass? I don't really get asked this, but it's a good excuse to show just what you can do on a bike with todays cases that come with wheels. When the show must go on!